By Car FROM THE PENNSYLVANIA TURNPIKE Take Exit 20 (Mid-County) and follow I-476 South to Exit 13 (St. Davids/ Villanova, formerly Exit 5). From this exit, turn right onto Rt. 30 East (Lancaster Avenue) and follow to Rt. 320 North. Turn left onto Rt. 320 North and follow to second traffic light, which is Montgomery Avenue. Turn right. Follow to Wendover Avenue. Turn right. The main entrance to Rosemont College is on the right. Leave the New Jersey Turnpike at Exit 6 (Pennsylvania Turnpike). Drive west on the Pennsylvania Turnpike to Exit 20 and follow I-476 South to Exit 13 (St. Davids/ Villanova, formerly Exit 5). From this exit, turn right onto Rt. 30 East (Lancaster Avenue) and follow to Rt. 320 North. Turn left onto Rt. 320 North and follow to second traffic light, which is Montgomery Avenue. Turn right. Follow to Wendover Avenue. Turn right. The main entrance to Rosemont College is on the right. SOUTH OF PHILADELPHIA Leave the New Jersey Turnpike at Exit 2 and follow Route 322 West to Commodore Barry Bridge to I-95 North. From I-95 take Exit 7 to I-476 North. Take I-476 to Exit 13 (St. Davids/Villanova, formerly Exit 5). From this exit, turn right onto Rt. 30 East (Lancaster Avenue) and follow to Rt. 320 North. Turn left onto Rt. 320 North and follow to second traffic light, which is Montgomery Avenue. Turn right. Follow to Wendover Avenue. Turn right. The main entrance to Rosemont College is on the right. FROM WASHINGTON, D.C. AND OTHER POINTS SOUTH Via I-95 approaching Chester, PA, take Exit 7 to I-476 North. Take I-476 to Exit 13 (St. Davids/Villanova). From this exit, turn right onto Rt. 30 East (Lancaster Avenue) and follow to Rt. 320 North. Turn left onto Rt. 320 North and follow to second traffic light, which is Montgomery Avenue. Turn right. Follow to Wendover Avenue. Turn right. The main entrance to Rosemont College is on the right. FROM CENTER CITY PHILADELPHIA Join I-76 West. Follow to I-476 South to Exit 13 (St. Davids/Villanova). From this exit, turn right onto Rt. 30 East (Lancaster Avenue) and follow to Rt. 320 North. Turn left onto Rt. 320 North and follow to second traffic light, which is Montgomery Avenue. Turn right. Follow to Wendover Avenue. Turn right. The main entrance to Rosemont College is on the right. By Train From Philadelphia's Penn Center/Suburban Station (16th Street and JFK Boulevard) or 30th Street Station (30th and Market Streets- Amtrak is located here), board SEPTA'S R-5 "Paoli Local" to Rosemont Station. The campus is a five minute walk from the Rosemont train station. From the station, walk north (to the right) 2 blocks on Airdale and turn left onto Wendover Avenue. 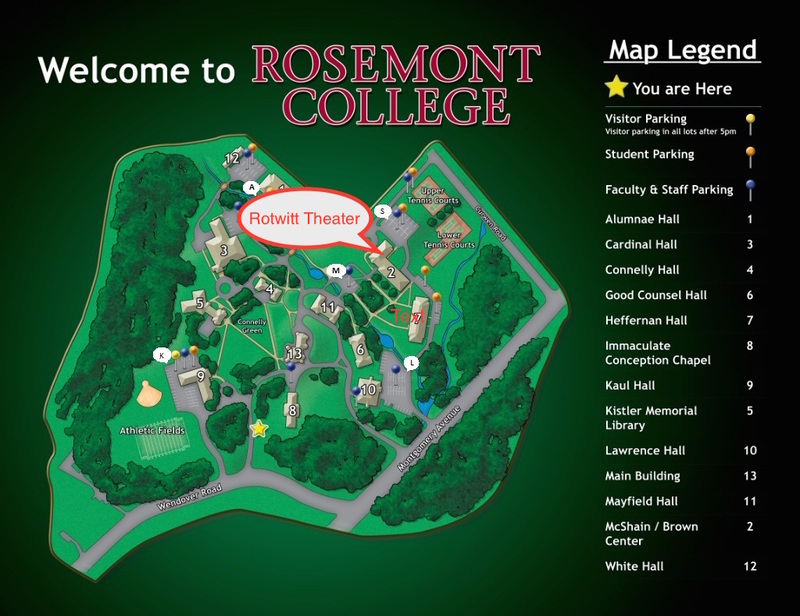 Rosemont College is on the left.